At first glance, whether or not to call Amok Thom Yorke’s second solo album seems like a tough call. On one hand, he isn’t solo here at all; he has Atoms For Peace, a backing band of considerable pedigree: Flea of Red Hot Chili Peppers on bass, acclaimed drummer and frequent Beck collaborator Joey Waronker, session percussionist Mauro Refosco and, as always, producer Nigel Godrich. But even as this new blood gives this record a more organic, diverse feel than The Eraser, a few facts can’t be ignored. For one, Atoms For Peace only exists at all because Yorke assembled these musicians to play Eraser tracks on tour with him. Plus, the reprise of Stanley Donwood’s black-and-white cities-in-ruin artwork indicates this is a direct sequel to Yorke’s debut. And besides, the music here is still mostly in line with Yorke’s post-millennial work, where melancholy electronics and skewered beats reign supreme. 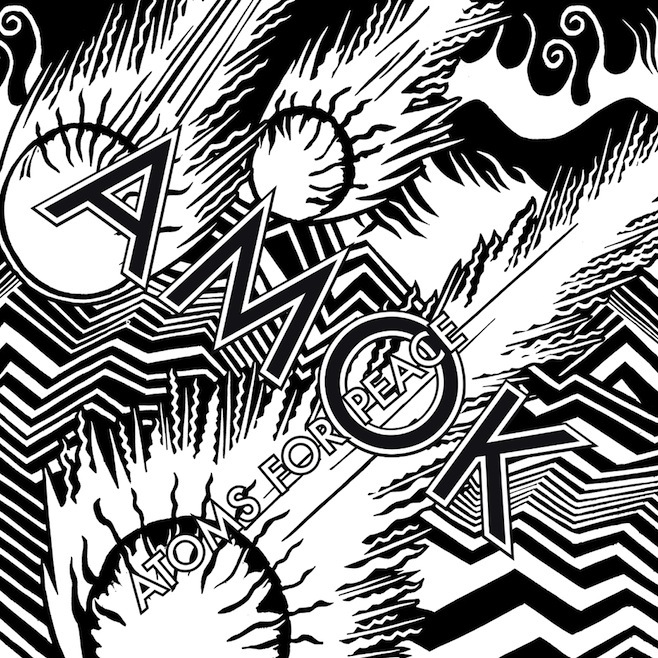 So, essentially, there’s no escaping that Amok plays as a dressed-up Yorke album, no matter how tight and funky the rhythm section. But where The Eraser emphasized his voice, and his words largely eschewed abstraction for personal and political meditations, this album runs perpendicular, preferring sound and feel to structure and directness. The music is still based in atmospherics and repetition, but Amok was largely culled from jam sessions rather than pieced together on a laptop, so even the relatively structured singles like “Default” and “Judge, Jury and Executioner” have a loose feel to them. This playful, exploratory bent sees the band messing with different approaches, and, at times, it pays off: “Ingenue” plays with decaying synth lines; “Dropped” rides an odd, staccato keyboard riff, while the beginning of “Before Your Very Eyes…” feels like a fresher take on The King Of Limbs‘ groove-oriented first half. Unfortunately, Atoms For Peace never truly give themselves over to a jam, nor do they focus on song structure, leaving a few meandering moments, like “Stuck Together Pieces,” to fall uneasily between the two extremes. Additionally, the album’s commitment to downplaying Yorke’s vocals ends up sucking a good bit of the humanity from these tunes, so nothing here hooks you in like “Black Swan” or has the emotional resonance of “Harrowdown Hill.” Of course, being the master musicians these men are, there are no real missteps here either, and Amok is consistently listenable on the whole, even if there aren’t too many specific moments to return to.